One reason tennis is so compelling is that the relationship between viewer and player is highly intimate. It’s a one-on-one connection, an affinity of projected values conscious and unconscious, visceral and intellectual, self and desired self, hate and love. No tennis player has ever been more swooned over than Roger Federer, often for good reasons that have been well-articulated by oodles of fans, commentators and, for better or worse, writers who may know tennis as well as I grasp particle physics but can surely recognize genius when they are pointed to it. There are many things I like about Roger Federer, most of which appeal to my mind. 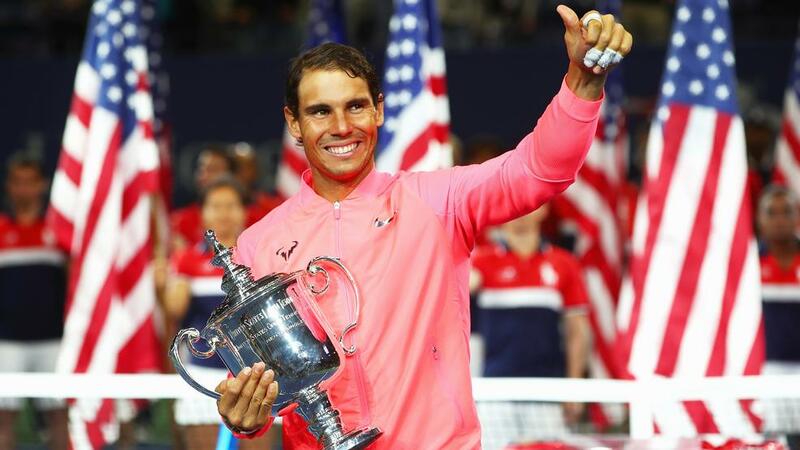 But my heart belongs much more to the man who just won the US Open, Rafael Nadal. Unquestionably, Federer is the avatar of the effortless, of grace and artistry, liquid-smooth ball-striking and tactical nuance. In certain ways, he has actually worked harder than Nadal to make it all look so easy. Not many see it that way. Talent? Talent is what Federer has in spades. Talent is smooth, as much a part of a particular genius’ DNA as eye color. Let that be your view and it’s safe to comfortably distance yourself and witness greatness from afar. One man’s eyes are simply darker. But persistence is far more implicating. To watch Nadal’s level of engagement – his sustained effort – is to call into question your own degree of commitment. Federer shows us an idea of what life might be: one regal, downhill moment after another, great shots rolling smoothly down the hill. The joy he gives is the joy of the answer, of his relentless (and impressive) ability to solve one problem after another with precision, grace, imagination. But Nadal demonstrates life’s sober realities -- difficult, painful, an upward effort. His gestalt is all about the questions. How badly do you want it? What are you willing to give up to get it? In 1974, the year I turned 14, I watched a documentary about World War II. After it was over, I asked my father, “Why can’t all countries be like Switzerland?” Couldn’t war be avoided if all nations behaved like Roger Federer’s native land? The response: “That’s like saying we should all be nice guys.” Implicit in my father’s message was that to be Switzerland wasn’t possible, that to be cool and above the fray was not particularly sustainable. Instead, like Nadal, I have spent my life distant from the cool, the effortless, consistently removed from the insiders that comprise the establishment and define conventional wisdom (such as the meaning of talent and why Roger Federer is worthy of worship). My path has been that of the outsider, of the underestimated who tenaciously will themselves towards success. Everyone knows this is not the easy path. Asked his advice for an ambitious tennis player, Nadal’s answer was blunt: Learn to suffer. But as life has also taught me, suffering can be redemptive.